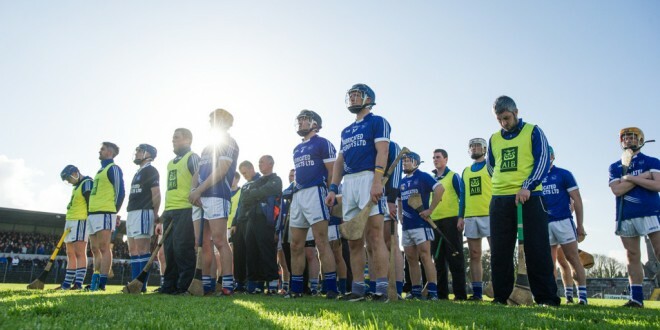 Cratloe will play Kilmallock in the Munster hurling final in the Gaelic grounds in Limerick. Photograph by John Kelly. 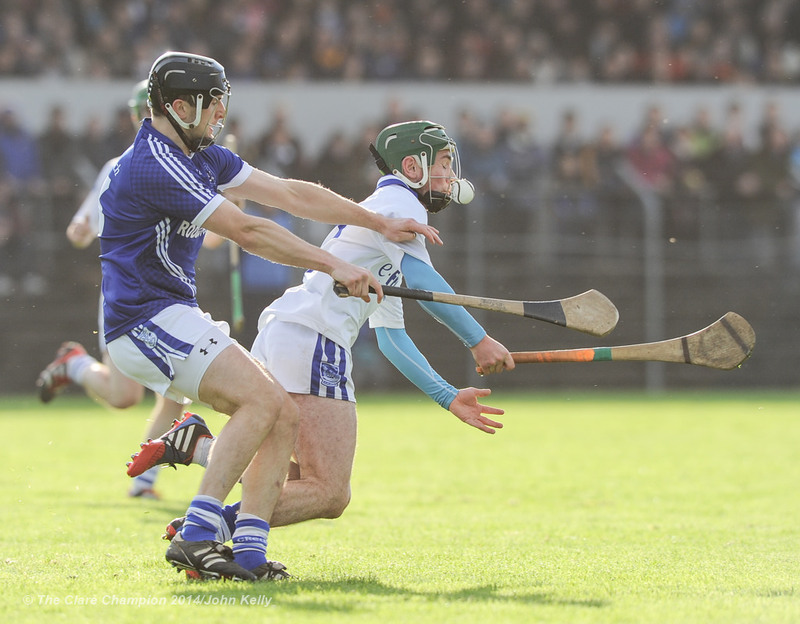 Aidan Mc Cormack of Thurles Sarsfield’s in action against Michael Hawes of Cratloe during their Munster Club quarter final in Cusack park. Photograph by John Kelly. Conor Ryan, Enda Boyce, Podge Collins and Conor McGrath, with a haul of 0-11, delivered outstanding displays as Cratloe qualified for yet another final, this time in the Munster championship where they will meet the Limerick champions, Kilmallock on November 23. 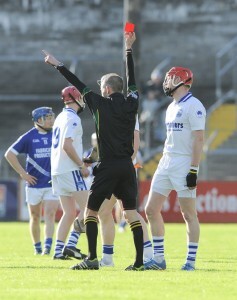 Denis Maher of Thurles Sarsfield’s gets sent off by the referee Cathal Mc Allister early on during their Munster Club quarter final in Cusack park. Photograph by John Kelly. 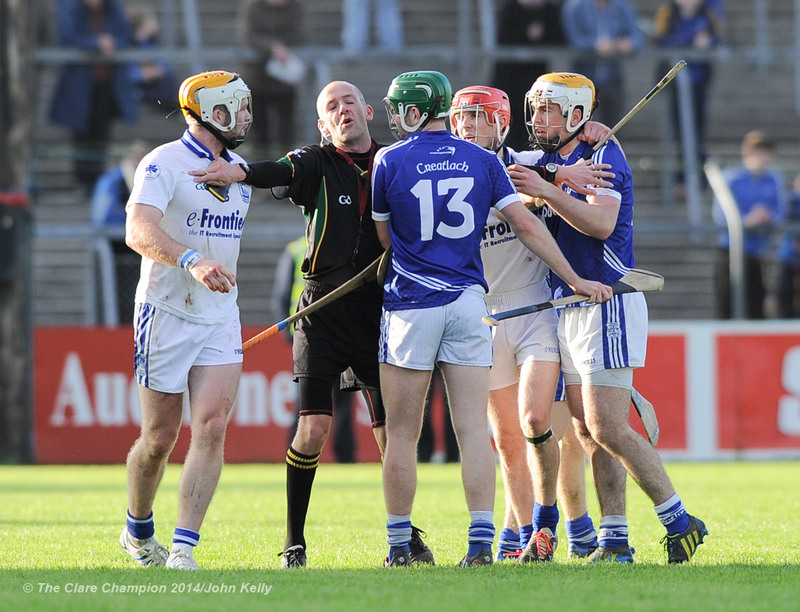 Of course Maher’s dismissal in the very first play, will be debated for some time and patrons will wonder if the outcome might have been different had referee Cathal McAllister not produced a red card. That said, however, Thurles will acknowledge that they were unable to curb the influence the aforementioned Cratloe quartet had on this tie and, at the end of the play, the Clare champions were deserving winners and through to their first Munster hurling decider. Three times the teams exchanged points in the opening quarter before the winners hit four unanswered scores through McGrath, Cathal McInerney, Sean and Podge Collins. As the game entered the one minute of ‘injury time’ which was signalled, the Clare champions struck a major blow when Podge Collins won a Conor McGrath delivery to score the game’s only goal. It gave the winners a seven point lead at the break when the score was 1-8 to 0-4 with wind advantage to come. Two points in as many minutes on the resumption stretched their lead but the visitors hit back with three scores making it clear that they were not going to go down easily. 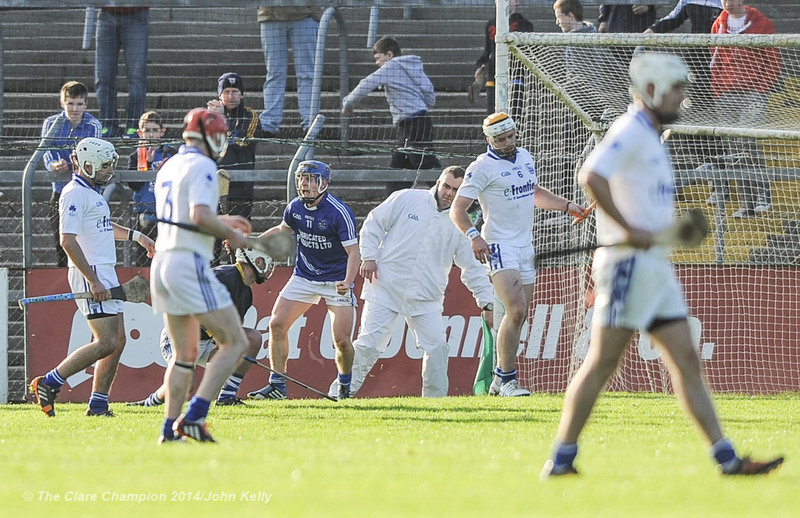 The margin was six at the three quarter stage (1-13 to 0-10. Cratloe hit the next two but three from the visitors left five between the sides with ten minutes remaining. Try as they did, however, Thurles just could not break down a strong Cratloe defence in which Conor Ryan and Enda Boyce were superb. In addition to those mentioned, Michael Hawes, Liam Markham and Sean Collins got through a lot of work. Michael Cahill, Padraic Maher, Billy McCarthy and Tommy Doyle worked hard for the Tipperary champions. 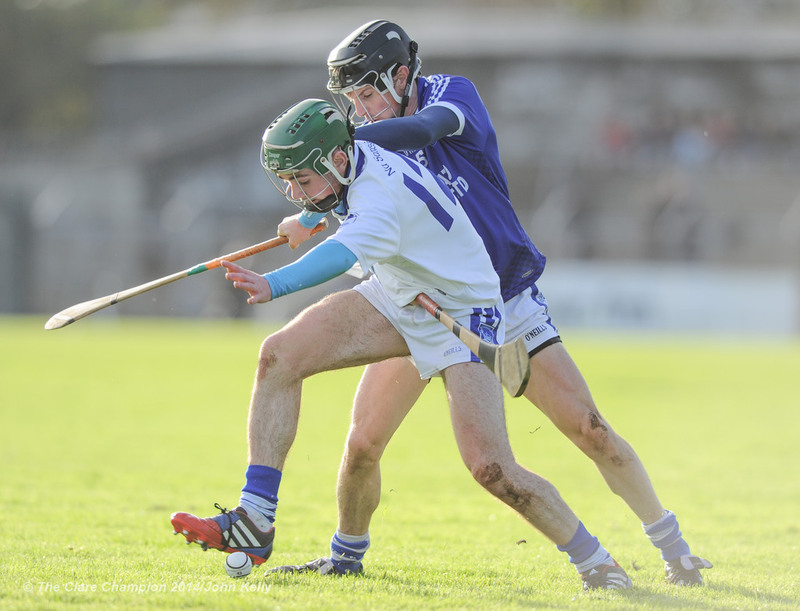 Feakle’s dreams of qualifying for their first Munster Club Intermediate hurling final were cruelly dashed by the Waterford champions, who outscored them by five points to one in the closing ten minutes. The East Clare side looked the more likely winners when they led by 0-10 to 0-5 at the interval, having played against a stiff breeze. In fact, apart from the opening minute they led right up to the 54th minute when two superb long range points from Paul Murray regained the lead for the Waterford champions. Cappoquin captain, Shane O’Rourke, who finished with an impressive tally of 0-11 increased their lead to two points before Colin Nelson cut the gap to a single point on the stroke of full time. Despite almost four minutes of injury-time, Feakle couldn’t salvage a last gasp equaliser and were left devastated when referee, Nathan Wall brought this absorbing tussle to an end. Cappoquin: Donal O’Rourke; Patrick Morrissey, Colm Looby, Timmy Looby; Shane Murray, Conor Murray, David Cahalane; Paul Murray, Finan Murray; Colin Landers, Andy Molumby, Shane O’Rourke (captain); P J Curran, Shane Coughlan, Killian O’Sullivan. Sub: Damian McCarthy for Colin Landers. 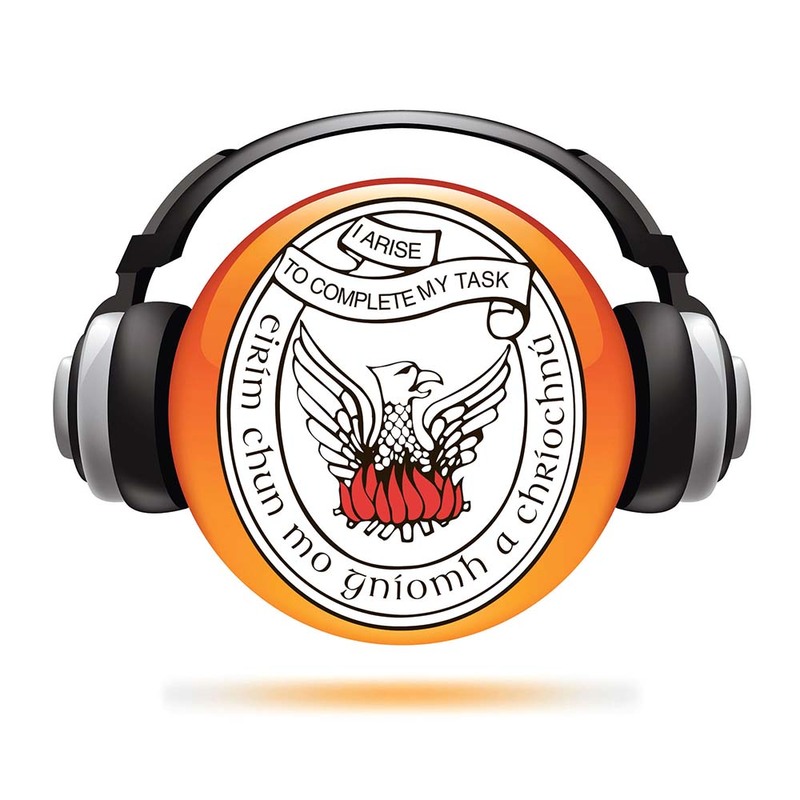 Feakle: Eibhear Quilligan; Justin Nelson, James Noonan, Evan McMahon; Killian Bane, Eoin Tuohy, Con Smyth; Shane McGrath, Henry Hayes; Oisin Donnellan, Raymond Bane, Martin Daly; Enda Noonan, Colin Nelson, Gary Guilfoyle. Subs: Sean O’Grady for Martin Daly, Colm Naughton for Killian Bane. 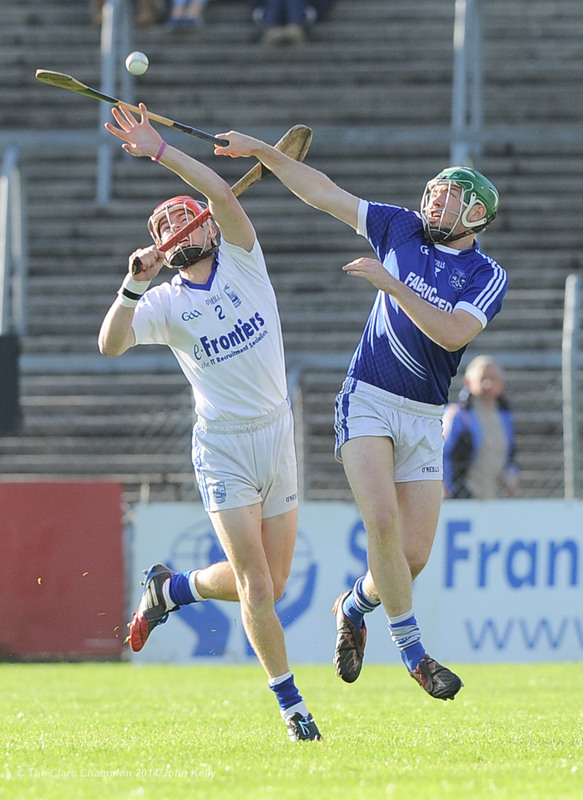 Sean Chaplin of Cratloe in action against Conor Lanigan of Thurles Sarsfield’s during their Munster Club quarter final in Cusack park. Photograph by John Kelly. Aidan Mc Cormack of Thurles Sarsfield’s in action against Sean Chaplin of Cratloe during their Munster Club quarter final in Cusack park. Photograph by John Kelly. 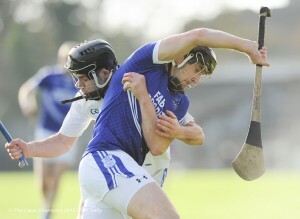 Michael Hawes of Cratloe in action against Conor Lanigan of Thurles Sarsfield’s during their Munster Club quarter final in Cusack park. Photograph by John Kelly. 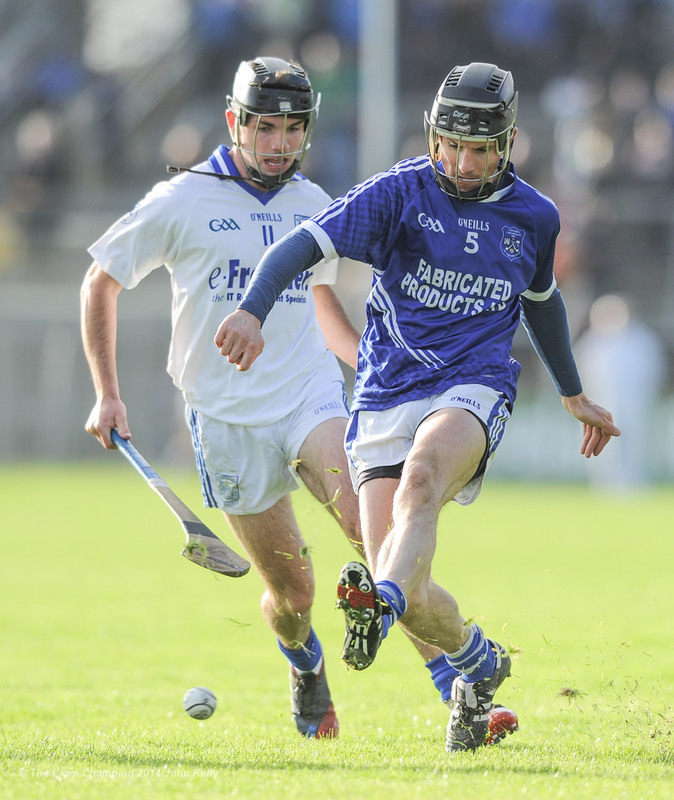 Stephen Maher of Thurles Sarsfield’s in action against Cathal Mc Inerney of Cratloe during their Munster Club quarter final in Cusack park. Photograph by John Kelly. Podge Collins of Cratloe turns to celebrate his goal against Thurles Sarsfield’s during their Munster Club quarter final in Cusack park. Photograph by John Kelly. 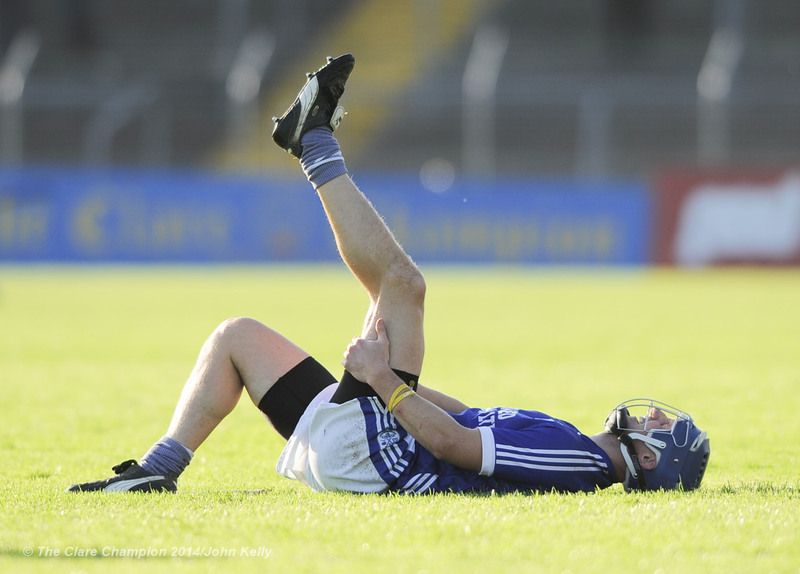 Gearoid Considine of Cratloe goes down injured while playing Thurles Sarsfield’s in the Munster Club quarter final in Cusack park. Photograph by John Kelly. 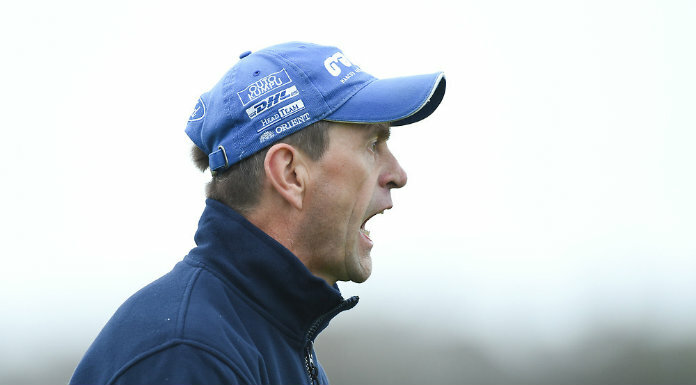 Referee Cathal Mc Allister moves to break up players from Cratloe and Thurles Sarsfield’s during their Munster Club quarter final in Cusack park. Photograph by John Kelly. 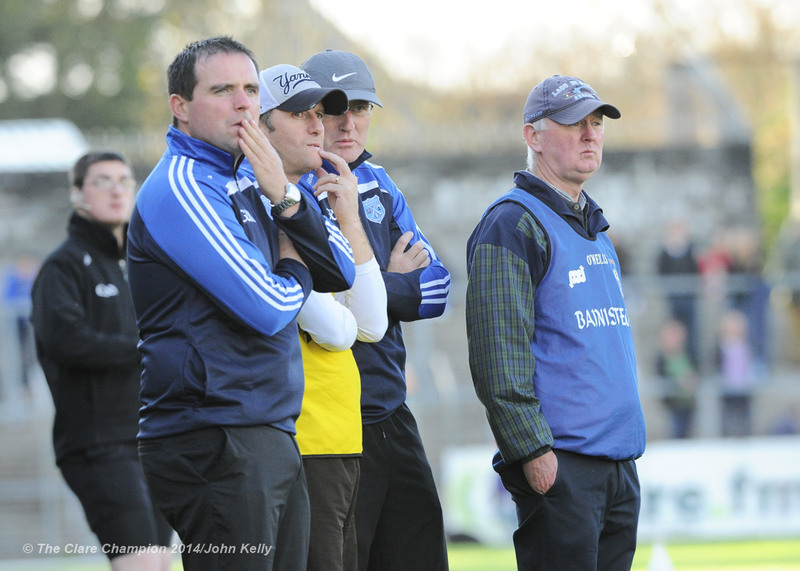 Cratloe manager Joe Mc Grath and his selectors, Ronan O Reilly, Alan Neville and Brian Lohan, on the sideline against Thurles Sarsfield’s during their Munster Club quarter final in Cusack park. Photograph by John Kelly. 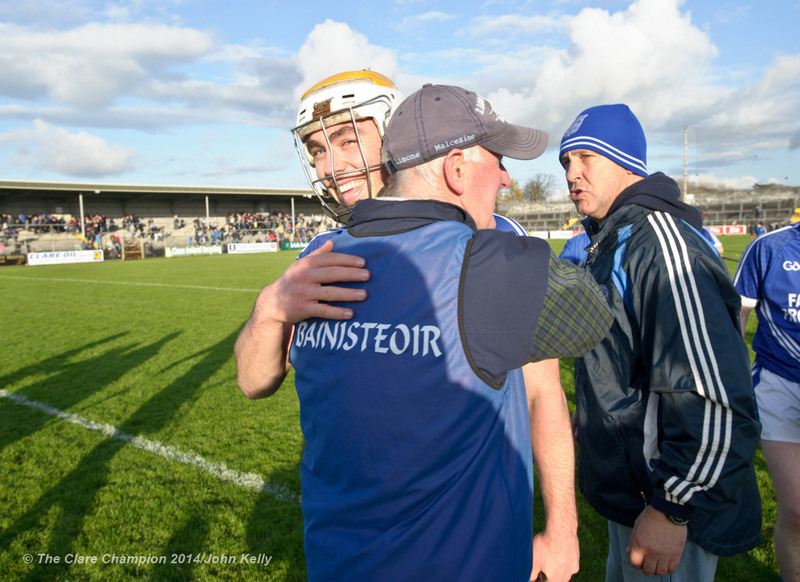 Cratloe’s Conor Mc Grath and his dad, the team manager Joe Mc Grath, embrace following the win over Thurles Sarsfields in the Munster Club hurling semi final at Cusack park in Ennis. Photograph by John Kelly.